The antibacterial qualities of Yellow Lotion control low-grade infection, while its astringent action causes contraction of the blood vessels, stops discharge, and controls excessive granulation (proud flesh).Yellow Lotion has a sedative effect on the exposed nerve ends. When applied to the wound, the sensation is a cooling and soothing one; it does not sting. Ranvet's Yellow Lotion promotes a dry surface, resistant to infection, without forming an undesirable hard crust on the wound. 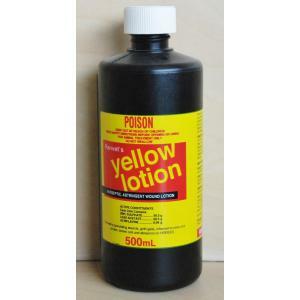 Yellow Lotion is a tried, proven and humane treatment for severe wounds and abrasions, granulating wounds, girth galls, rope burns, foot abscesses, inflamed bruises and sprains. For healing effect to be continuous, and therefore quickest, it is preferable that Yellow Lotion be applied to the wound soaked in a pad of cotton wool and held in place by a bandage. A fresh dressing should be applied twice a day. Before applying the Yellow Lotion soaked pad, first hose away any dirt or debris from the wound. After this initial clean out, do NOT continue to hose the wound, as this will wash away nature's healing lymph. Less severe wounds and those in areas that are difficult to bandage should be dabbed liberally and frequently each day. If treating older wounds where granulation tissue is extreme and bulging, first use a combination of Copper Sulphate (bluestone) dissolved in Yellow Lotion at rate 30g per litre. When the bulge has been reduced to skin level, continue treatment using only the Yellow Lotion . In all cases where a horse has sustained a severe wound a booster injection of tetanus toxoid is warranted. Treating sprained and bruised tendons. Yellow Lotion's soothing, astringent action is most beneficial in the treatment of sprains and bruises, especially to the tendons. Yellow Lotion is a first aid dressing for burns. Yellow Lotion provides an effective emergency first aid treatment for burns. To reduce skins temperature and pain, the burn should be immediately flooded with cold, running water. Next apply a dressing soaked in Yellow Lotion . Apart from providing additional pain relief, it will also reduce tissue fluid loss and help prevent any possibility of infection to which burns are extremely prone. Rope burns are frequently suffered by unbroken or frightened horses and Ranvet's Yellow Lotion provides soothing relief from these painful injuries. Unfortunately, flesh wounds are a fact of life around horses so you would be well advised to always have a bottle of Yellow Lotion on hand providing you with the ability to give on-the-spot treatment to an injured horse. It cleanses, it soothes and, above all, it heals! Whereas creams tend to attract dust and dirt, thereby potentiating infection, they also stop air reaching the wound. Yellow Lotion allows the wound to breathe, and all wounds heal faster in the presence of oxygen. The active constituents in Ranvet's Yellow Lotion are Acriflavine 0.9g/L, Zinc Sulphate 50.5g/L and Lead Acetate 50.5g/L.